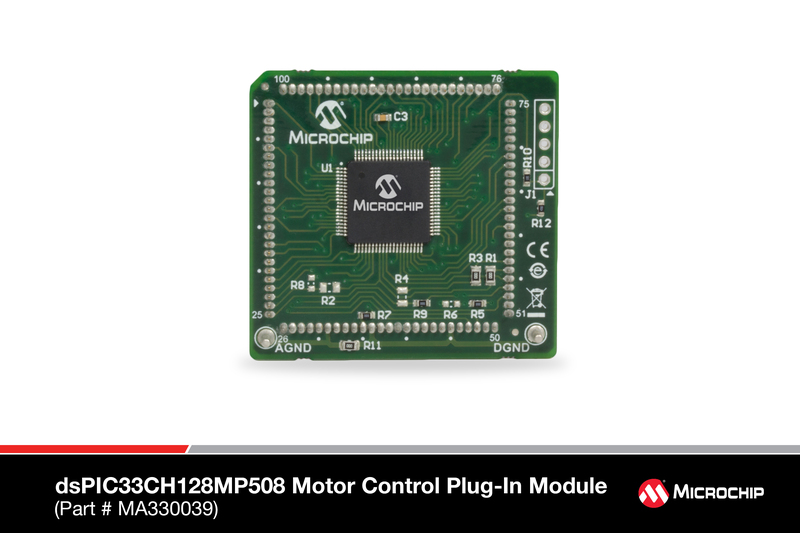 The dsPIC33CH128MP508 Motor Control PIM is designed to demonstrate the capabilities of the devices from the dsPIC33CH128MPxxx family of dual core, 16-bit Digital Signal Controllers (DSCs). The dsPIC33CH128MPxxx devices have two DSC cores, namely ‘Master Core’ and ‘Slave Core’, that can run independently at different device frequencies. This PIM can be used to demonstrate and develop a single motor control application by inserting it in the 100-pin PIM interface header provided on compatible motor control development boards. 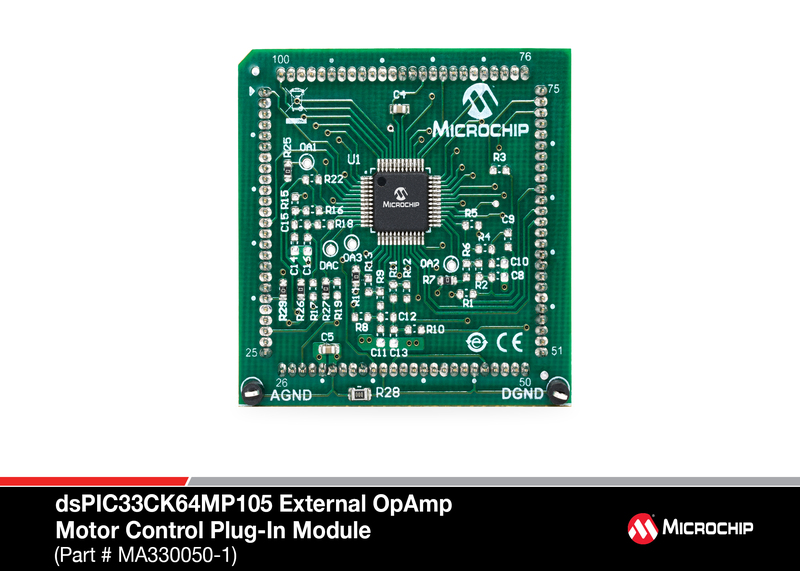 When operating this PIM on the dsPICDEM™ MCLV-2 or MCHV-2/MCHV-3 Development Boards, use an external op amp configuration matrix board. This PIM also works with the the Low-Voltage Motor Control Bundle. The dsPIC33CH512MP508 is a dual core device. The Master core, as well the Slave, can be debugged and programmed using this PIM. Since there are two cores available in the dsPIC33CH512MP508 device, there are multiple ways to program and debug the Master and the Slave. 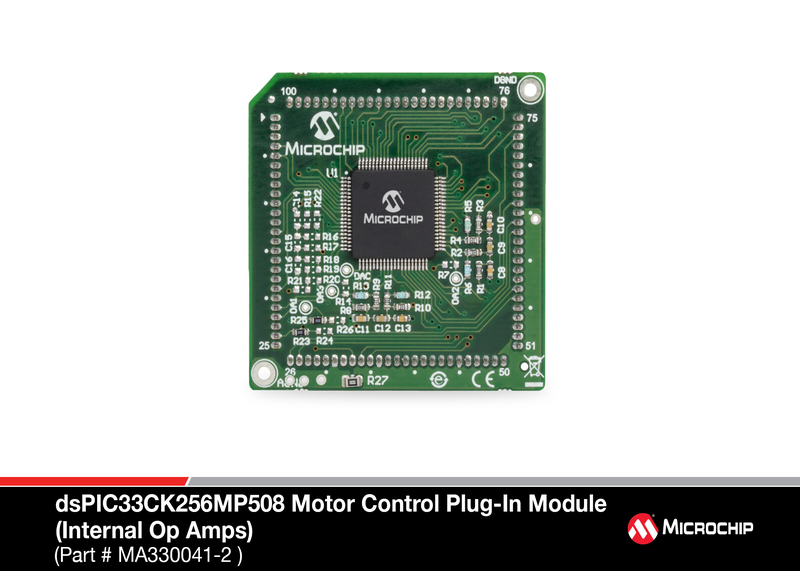 The dsPIC33CH512MP508 Motor Control PIM (MA330045) is designed to demonstrate the capabilities of the dsPIC33CH512MP508 device. The devices from the dsPIC33CH512MP508 family are dual core DSCs. 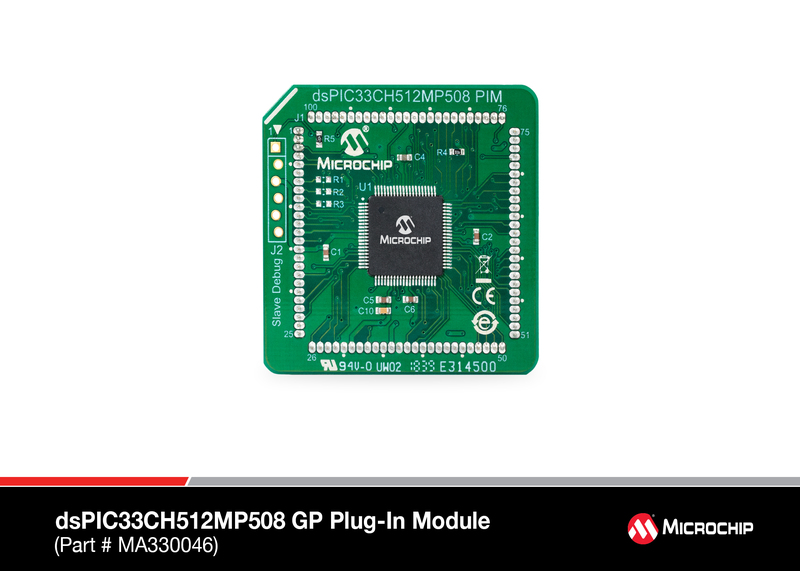 The dsPIC33CH512MP508 has two Digital Signal Controller (DSC) cores, namely ‘Master Core’ and ‘Slave Core’, that can run independently at different device frequencies. 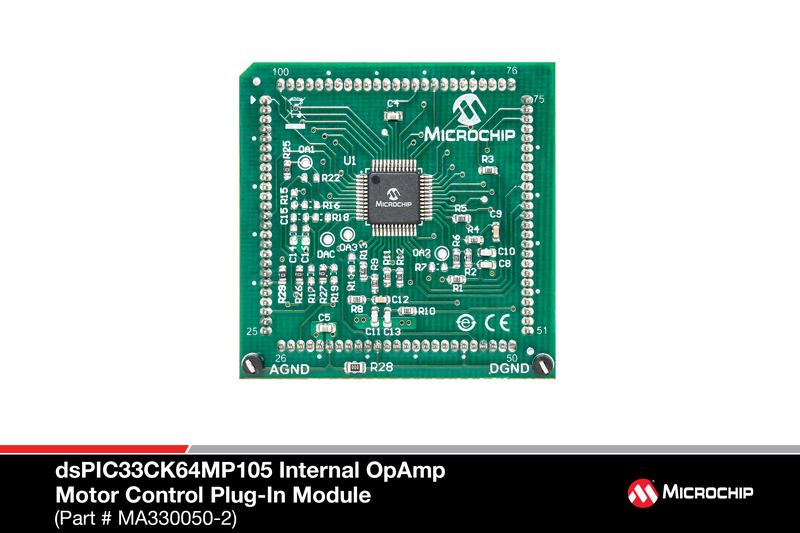 This plug-in module comes with an 80-pin dsPIC33CK256MP508 TQFP device. It enables using the OpAmps on the MCLV-2, MCHV-2 and MCHV-3 boards. 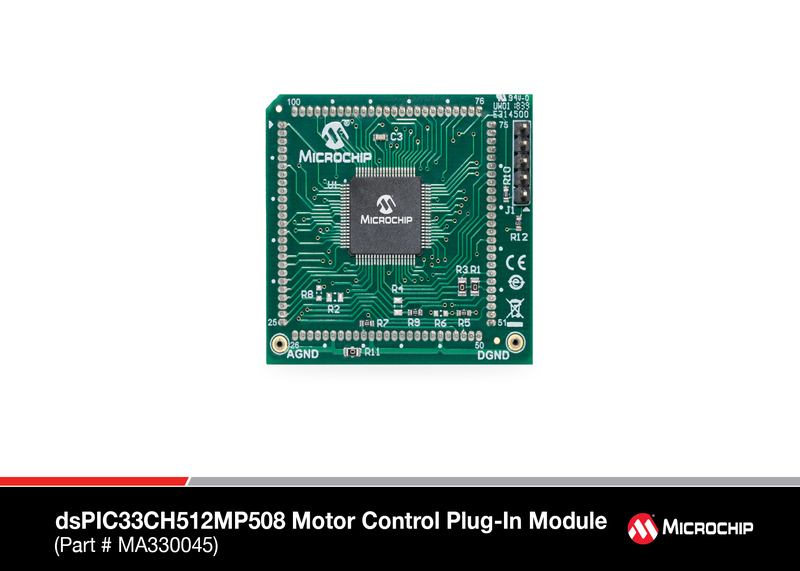 It can be used with the Microchip MCHV-2 [DM330023-2], MCHV-3 [DM330023-3], MCLV-2 [DM330021-2] and Low Voltage Motor Control Development Bundle [DV330100]. This PIM is not compatible with the MCLV[DM330021] or MCHV [DM330023]. 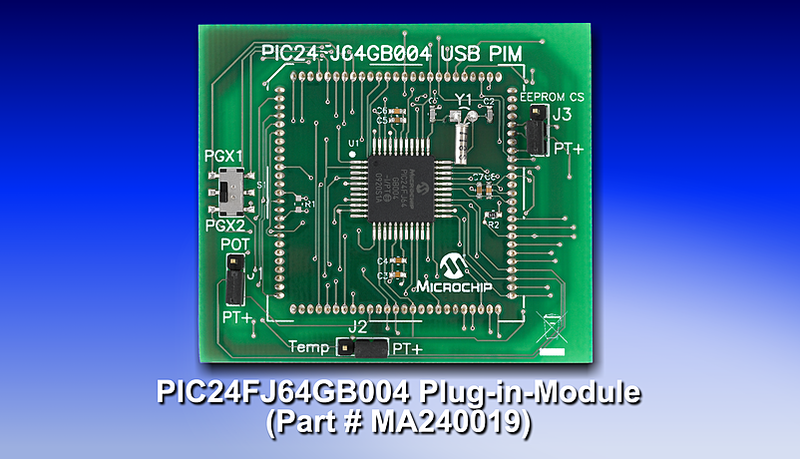 This PIM can be used to evaluate the dsPIC33CKxxxMP50x, and dsPIC33CKxxxMP20x devices.This plug-in module (PIM) features an dsPIC33CK256MP508 80-pin TQFP device. This PIM can be used to evaluate the dsPIC33CKxxxMP50x, and dsPIC33CKxxxMP20x devices. 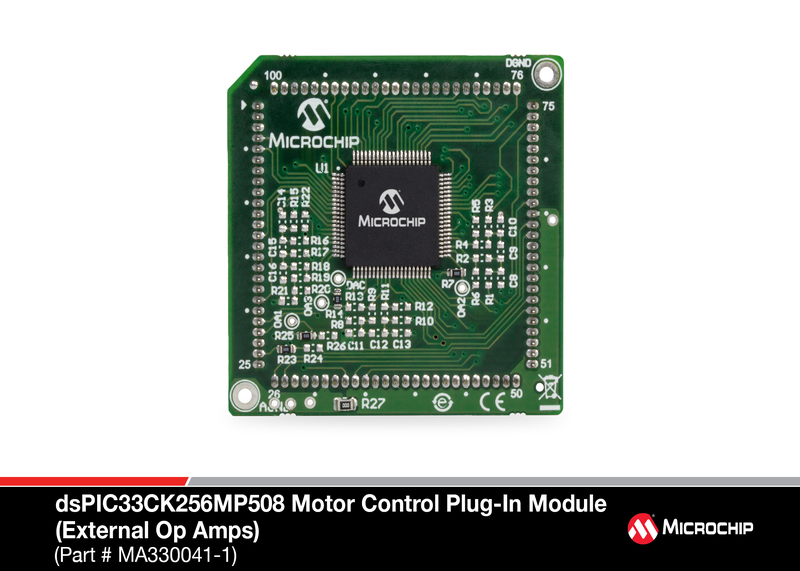 It enables using the OpAmps on the MCLV-2 [DM330021-2], MCHV-2 [DM330023-2], MCHV-3 [DM330023-3] boards and Low Voltage Motor Control Development Bundle [DV330100]. 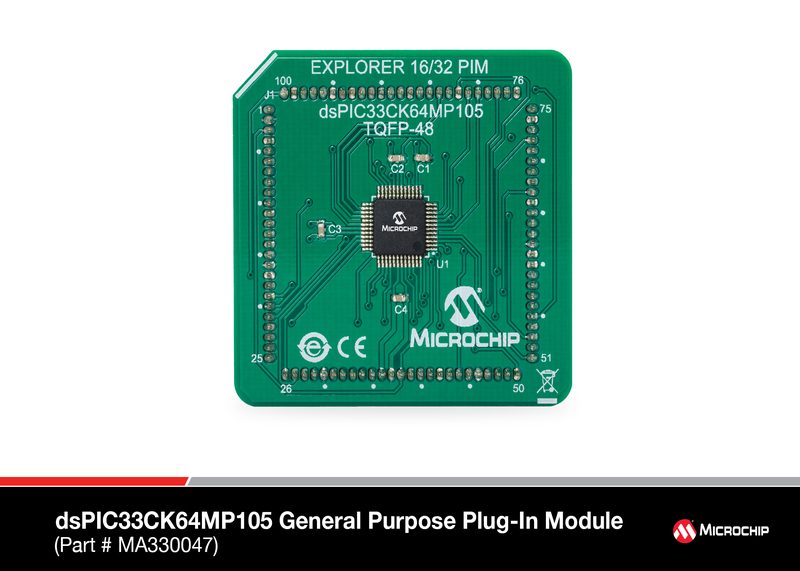 The dsPIC33CK64MP105 General Purpose Explorer 16/32 PIM (MA330047) is designed to demonstrate the capabilities of the dsPIC33CK64MP105 family using the Explorer 16/32 Development Board (DM240001-2). The DP PIM provides access to the dsPIC33EP128GS806 analog inputs, the Digital-to-Analog Converter (DAC) outputs, the Pulse-Width Modulation (PWM) outputs and the General Purpose Input and Output (GPIO) ports. 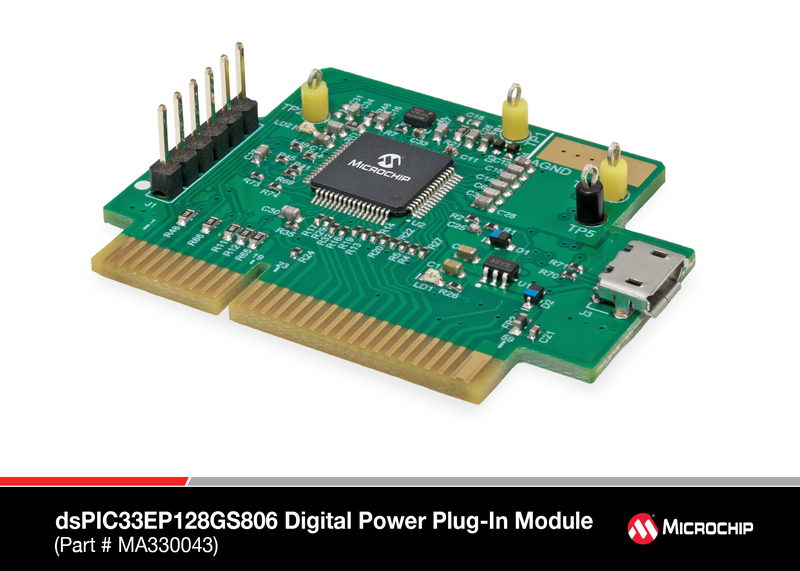 The dsPIC33FJ128GP804 Graphics Plug-In-Modules (PIMs) demonstrate the capabilities of the dsPIC33FJ128GP804 Digital Signal Controller (DSC) and the PIC24HJ128GP504 Microcontroller (MCU) using the Explorer 16 Development Board and the PICtail™ Plus Daughter Boards for graphics. and the PICtail Plus daughter boards. package. The dsPIC33FJ128GP804 is equipped with Peripheral Pin Select (PPS), The PIM takes advantage of PPS by using zero ohm resistors to connect the I/O to the 100-pin Explorer 16 Development Board. family of general purpose devices using the Explorer 16 Development Board and the PICtail. The dsPIC33FJ12GP202 is a high-performance 16-bit digital signal controller within a small 28-pin 6x6 mm QFN package. The dsPIC33FJ12GP202 is equipped with Peripheral Pin Select (PPS), The PIM takes advantage of PPS by using zero ohm resistors to connect the I/O to the 100-pin Explorer 16 Development Board. family of general purpose devices using the Explorer 16 Development Board and the PICtail Plus daughter boards. 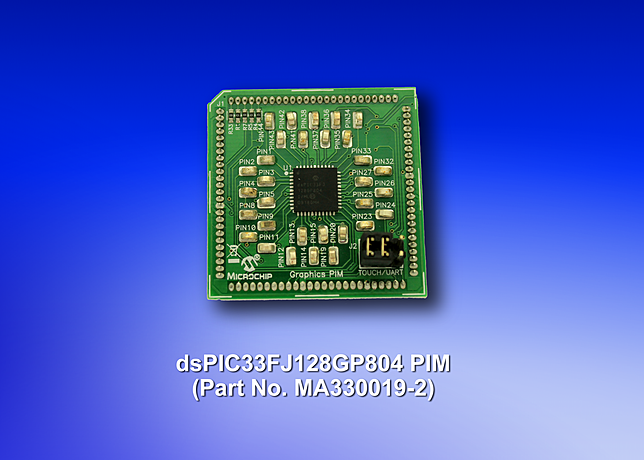 The dsPIC33FJ12MC202 is a high-performance 16-bit digital signal controller within a small 28-pin 6x6 mm QFN package. 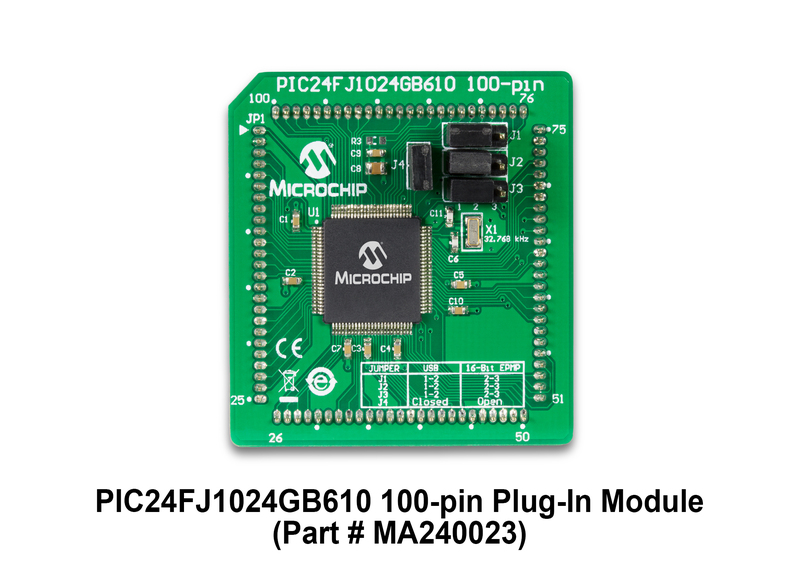 The dsPIC33FJ12MC202 is equipped with Peripheral Pin Select (PPS), The PIM takes advantage of PPS by using zero ohm resistors to connect the I/O to the 100-pin Explorer 16 Development Board. 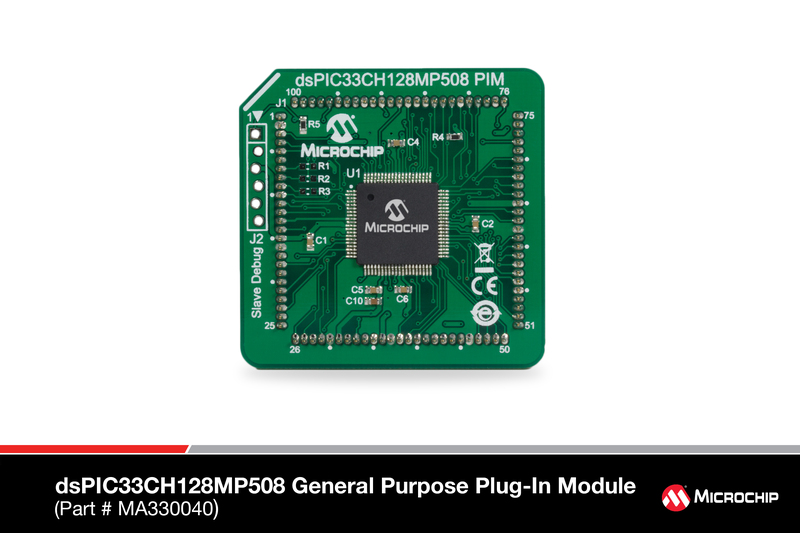 The dsPIC33FJ256MC710 PIM is designed to demonstrate the capabilities of the dsPIC33FJ256MC710 family of motor control devices using development boards such as the Explorer 16 Development Board, which support 100-pin PIM interfaces. The dsPIC33FJ256MC710 is a high-performance 16-bit Digital Signal Controller in a 100-pin TQFP package. package. The dsPIC33FJ32GP204 is equipped with Peripheral Pin Select (PPS), The PIM takes advantage of PPS by using zero ohm resistors to connect the I/O to the 100-pin Explorer 16 Development Board. This processor PIM includes a 100-pin PIC24EP512GU810 MCU sample. The PIM plugs into the Explorer 16 Development Board. The PIC24F16KA102 PIM is designed to demonstrate the capabilities of the PIC24F16KA102 family using the Explorer 16 Demonstration Board kit. 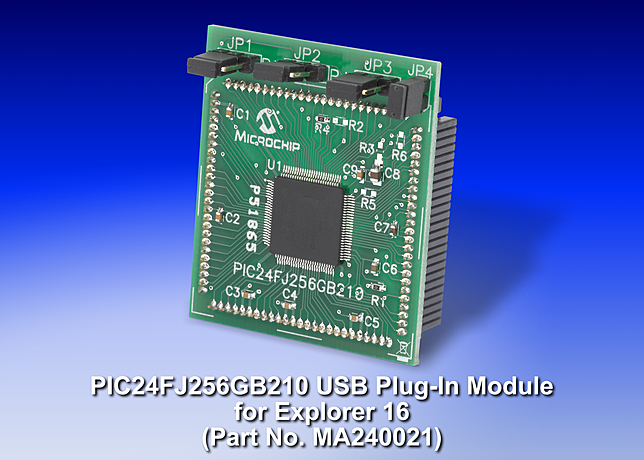 The MCP23S17 28-pin port expander is used in PIC24F16KA102 PIM to perform all of the base functions on the 100 pin Explorer 16 board. 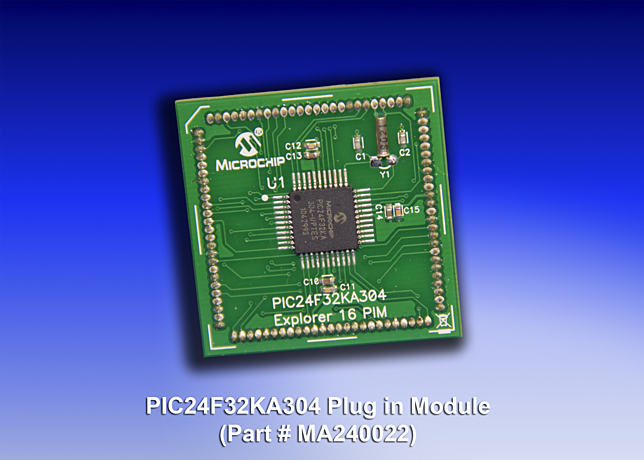 The PIC24F32KA304 Processor Plug-in Module (PIM) is designed to demonstrate the capabilities of the PIC24F32KA304 family using the Explorer 16/32 Demonstration Board. 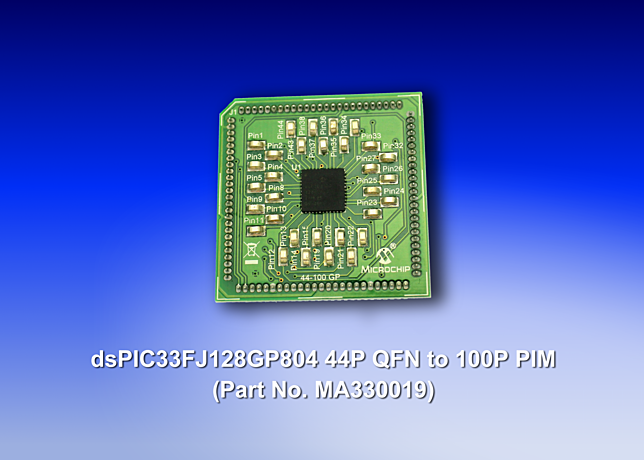 This processor PIM includes a 100-pin PIC24FJ128GA010 MCU sample. The PIM plugs into the Explorer 16 Development Board. This processor PIM includes a 100-pin PIC24FJ256GA110 MCU sample. The PIM plugs into the Explorer 16 Development Board. 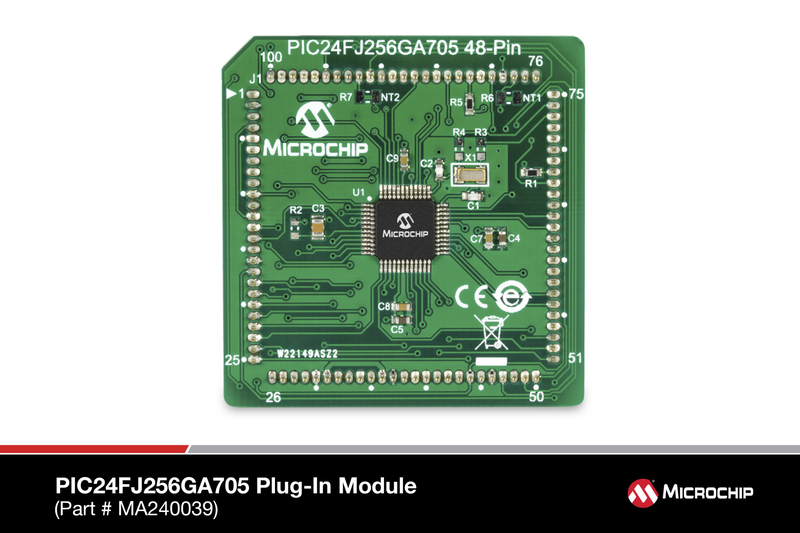 The PIC24FJ256GA705 Plug-in Module is designed to demonstrate the capabilities of the PIC24FJ256GA705 family using the Explorer 16/32 Demonstration Boards. Most of the pins from the device are mapped directly to the PIM connector. The exceptions are those pins that are remapped to provide remappable functionality to the pins in the PICtail™ Plus socket. This processor PIM includes a 100-pin PIC24FJ256GB110 MCU sample. The PIM plugs into the Explorer 16 Development Board. The PIC24FJ256GB210 PIM is designed to demonstrate the capabilities of the PIC24FJ256GB210 family using the Explorer 16 Demonstration Board and the PICtail™ Plus Daughter Board. 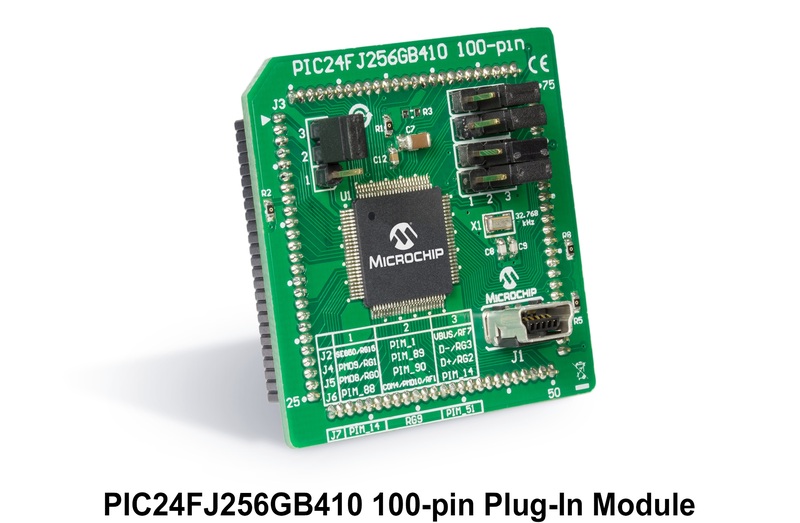 This plug-in module comes with a 44-pin PIC24HJ128GP504 MCU sample. Use with the Explorer 16 Development Board (DM240001 or DM240002) and Graphics PICtail Plus Daughter Boards (AC164127, AC164127-3, AC164127-4, AC164127-5, AC164127-6). 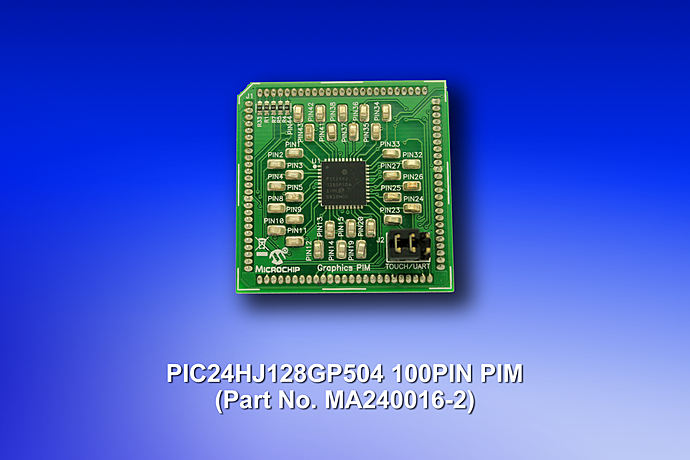 This processor PIM includes a 100-pin PIC24HJ256GP610A MCU sample. The PIM plugs into the Explorer 16 Development Board.